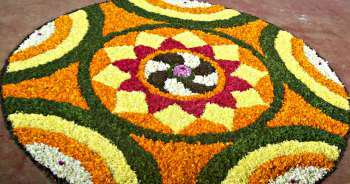 The Onam festival of Kerala, celebrated in South India is a harvest festival. It is celebrated generally in the Malayalam month of Chingam, that falls in August or September. It is a main regional festival of Kerala. Thiru onam is to be celebrated on September 14th, 2016. Onam is celebrated to commemorate the return of King Mahabali, who was a beloved ruler of his people. This festival is a ten days celebration and many tourists, Indians from other states and foreigners visit Kerala during the festival. 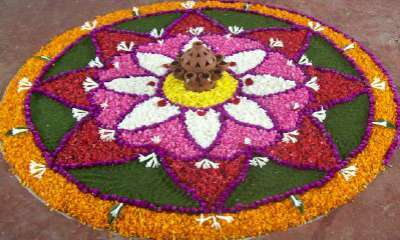 Onam festival has religious as well as social significance. Onam brings the families together. It is fun. Onam festival includes the famous boat races, carnivals, dances, cultural programmes, the floral design called Pookalam and the traditional festive meal, which is known as Onasadya. There are also the parades of decorated elephants, the traditional Kathakali dances and the fireworks. Onam is celebrated to commemorate the homecoming of the Asura(demon) king Mahabali. King Mahabali was a popular and able king. He was an ardent devotee of Lord Vishnu. He was a good and successful ruler. His subjects liked him and were happy. He was brave and benevolent. But he also wanted to conquer the whole earth. His fame as an able king disturbed the gods. They feared that he may attack them and become the King of gods. They requested the Lord Vishnu to save them. Lord Vishnu took his fifth avatar - incarnation - as Vamana, meaning dwarf, a poor brahmin and went to ask for land to the Mahabali. He asked for only three steps of land to which the King readily agreed. With the first step, Vamana covered the whole earth, with second he covered the skies and then asked where he should put his third step. King Mahabali realised that this was no ordinary poor brahmin and offered his head for placing hte third step. With this third and last step, Vamana the Lord Vishnu, pushed Mahabali to Patala, the netherworld. The king requested Vamana to reveal is true form. Lord Vishnu appeared in is true form. He granted the king permission to return to his kingdom once a year. He also blessed him that the king would always be loved by his subjects. The people of Kerala celebrate the visit of King Mahabali every year as Onam. The celebration goes on for 10 days. The 10 days onam celebration. This festival is celebrated for ten days and the tenth day, the Thiru Onam is the most important. All the 10 days are considered auspicious. On the first day, Pookalam, the flower rangoli(a floral design on the floor like a carpet) is started. It is to welcome the King Mahabali. The flower arrangement gets bigger everyday. People buy new clothes, accessories etc. they decorate the house. Preparations for a big feast starts by making pickles and pappadoms. People want to show King Mahabali that they are happy and contented. Kerala People, living in other places visit their homes to celebrate with their families. Conical shaped idols are made with clay. The 10th day, King Mahabali comes to visit his people. A special meal is prepared in his honor and served to the family and friends. The meal is served on a long banana leaf. It consistes of rice, curries, pickles, chutney, payasam, puddings. A variety of games are played on this occasion. The boat race of Onam is an event to watch. It is conducted on ricer Pampa. Long boats, grace Snake Boats are used. They resemble the raised hood of a cobra. Many other games are played. The families play the games after a feast. Kummattikali - this is a colorful mask dance. the dancers go from house to house singing and dancing. The characters are deities and a witch. Pulikali - A tiger dance - This is a dance of ‘tiger hunting. It is related to Kaduvakali, a 200 year old art. Kathakali - Kathakali is a popular classical dance form of Kerala. 'Katha' means a story. The characters wear heavy makeup and costumes. Stories from Hindu epics are the themes for this dance. Thumbi Thullal - is a all women dance and singing event on the occasion of Onam. Kaikotti kali - or Thiruvathirakali is an extremely popular folk dance performed by the maidens of Kerala. It is a group dance. Women, both young and old dance.